If you are in college or have a child about to attend college, what’s the best way to spend those 4 years? I’ll tell you one thing, I certainly didn’t manage my college career the way Millennial entrepreneurs Justin Lafazan and Dylan Gambardella did. I certainly wish I had! They are wise beyond their years, I almost forgot I was even talking to college students. Justin is a student at The Wharton School and Dylan attends Duke. Justin took a gap year to focus on his entrepreneurial pursuits and makes the case for why we all need a gap year in our lives. 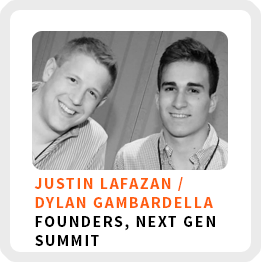 As if college isn’t demanding enough, these guys are writing books, starting businesses and produce a very popular conference for Millennials called Next Gen Summit. They’re even starting their own VC fund exclusively for young entrepreneurs. They are connected to thousands of young entrepreneurs and want to help them grow their business with an almost zealous focus on building relationships. Theses guys are super connectors. I don’t care how old you are or at what stage of your career you find yourself, but you gotta hear these guys out. They share some unconventional advice we all need to hear, especially if you are figuring out how to create your own work. Book recommendations: How Win to Friends and Influence People and 4-Hour Work Week. 90-day goal: Get their new VC fund off ground. Want to meet: Senator Mark Warner (Dylan) and Jamie Dimon (Justin). Regain focus: Dylan says he thinks about the basics and Justin unplugs from his biz completely. Favorite productivity tools: Macbook Pro for Dylan and Justin listens to a 2-hour piano set of music to help him focus. Ideal work environment: Working in each other’s kitchen. Can’t find your purpose? Justin and Dylan offer this advice . . . Reverse engineer your success. Justin believes if you want to achieve success, reverse engineer it. First, define what success means to you. Second, find people who live that version of success and ask them for their recipe. Talk to people doing what it is you want to do and then add your own take on their recipe for success. From Justin’s experience, the most successful people asked bigger questions than the rest of us and focus on their own path for achieving their own version of success. Find a problem you are excited about solving. Dylan believes the business of business is to make the world a better place. He advises setting small daily goals and focus on small wins to keep you motivated over the long term. Check out this video of Dylan offering stock tips from the floor of The New York Stock Exchange as a kid . . .